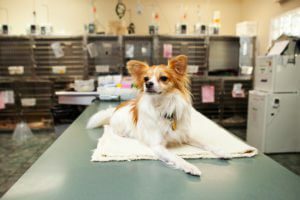 Our 24 hour pet hospital is located in Clearwater and serves St. Petersburg, Largo, Seminole, Palm Harbor, Dunedin, Indian Rocks Beach, Bay Pines, Safety Harbor, Pinellas Park and other areas of Pinellas County. Emergency: Call ahead to our 24 hour emergency vet hospital in Clearwater and let us know you’re coming. No appointment is necessary. Learn more about your emergency visit. Our Clearwater location is well-equipped to serve your pet with two surgical suites, nine exam rooms and diagnostic equipment including ultrasound, X-rays and more. We are happy to offer Saturday ophthalmology appointments. Next summer, we will be moving into a new 17,000-square foot building, just a few steps from our current location.